1. Heat a frying pan or wok then sear the pork. 2. When oil and juice comes out of the pork, add garlic and onions then cook for 2 minutes. 3. Pour-in the soy sauce, vinegar, and water then bring to a boil. 4. Shake-in the ground black pepper and stir. 5. Cover and simmer for 15 minutes or until the pork is tender. 6. 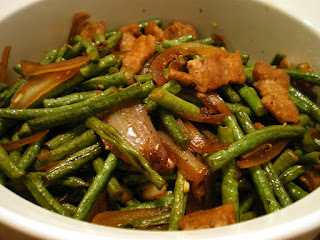 Add the string beans and cook for 3 to 5 minutes. 7. Turn off the heat and transfer to a serving bowl.